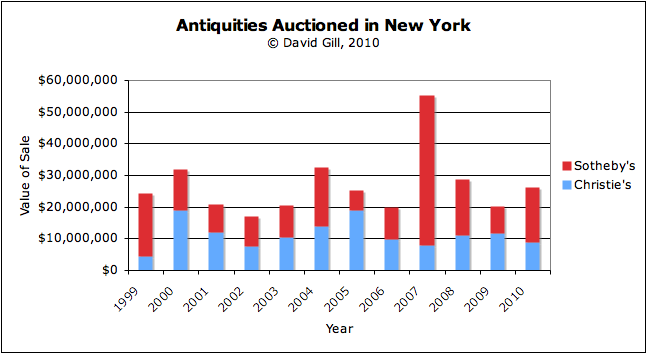 During June 2010 there have been two major sales of antiquities at Christie's and Sotheby's. Over $26 million worth of antiquities were sold. These half-year results show that 2010 is ahead of the total sales for 2005, 2006 and 2009. 2007 was an exceptional year with the sale of the Guennol Lioness at Sotheby's for a record-breaking $57 million. Christie's accounted for just under $8.7 million. Their top-selling piece was a Roman bronze lamp-stand with a youth that went for $1.1 million. Christie's had been faced with calls for three objects to be withdrawn from the sale as the lots appeared to be similar to objects shown in photographs that appeared in the Medici Dossier seized in the Geneva Freeport. One of the three pieces, an Apulian rhyton, apparently failed to sell, while the marble youth with a cockerel sold for less than when it appeared at the same auction house in 2004. Overall, Christie's only sold 64% of their lots. Sotheby's seem to have a strategy of offering fewer objects but with carefully researched collecting histories. Over $14.5 million was accounted by three lots: the Giuistiani head of Athena, a Roman marble group of three satyrs fighting a serpent, and a Roman torso of a Julio-Claudian emperor. These sales suggest that when auction-houses conduct thorough due diligence research on their lots and present fuller collecting histories (sometimes unhelpfully called "provenance" ), buyers have more confidence.